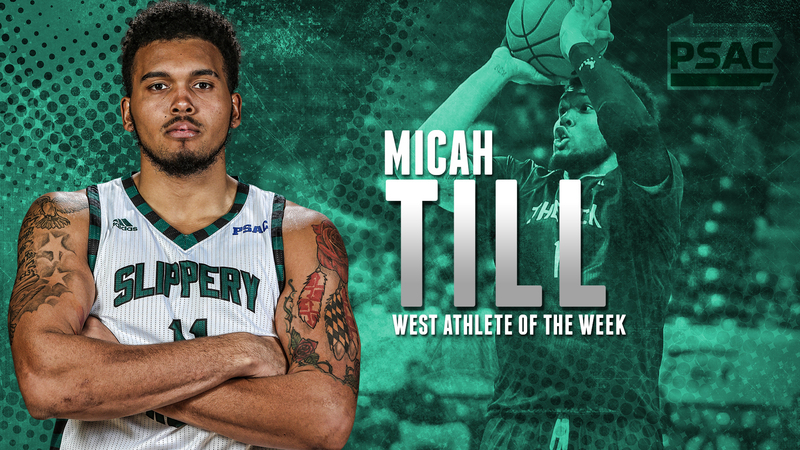 Slippery Rock University men’s basketball forward Micah Till has been named the Pennsylvania State Athletic Conference Western Division Athlete of the Week for the fourth time this season, as announced by the league office Monday. Till, a redshirt sophomore from Upper Marlboro, Maryland, put up a dominant effort last week in leading The Rock to a pair of crucial wins. He averaged 23.0 points, 10.0 rebounds and 2.5 steals in wins over Gannon and California (Pa.) that vaulted SRU into sole possession of second place in the PSAC West standings. Last Wednesday, Till scored 19 points, grabbed 11 rebounds, handed out one assist and recorded three steals in a 72-61 win over Gannon that moved SRU ahead of the Golden Knights and into second in the PSAC West. He followed that up Saturday by scoring 27 points and grabbing nine rebounds in just 27 minutes in an 86-65 road win at California. Till played limited minutes in the second half of that game after scoring 21 points and grabbing seven rebounds in the first half alone. Till now ranks third in the nation in double-doubles with 14 on the year and has tallied at least 20 points in a game 15 times this season. He averages 21.2 points, 11.1 rebounds, 1.4 assists and 1.3 blocks per game. On top of ranking third in double-doubles, Till also ranks eighth in the nation in rebounding (11.1 per game), second in the nation in total rebounds (233), third in the nation in offensive rebounding (4.4 per game) and sixth in the nation in total field goals made (169). Slippery Rock is 17-4 overall and 11-4 in PSAC games and will welcome rival and PSAC Western Division leading Indiana (Pa.) Wednesday night. The Crimson Hawks are 16-5 overall and 12-2 in the PSAC, just 1.5 games ahead of The Rock for the top spot in the Western Division. Wednesday night’s tip is set for 7:30 p.m. at Morrow Field House. The game will serve as the annual “White Out” night, with all fans encouraged to wear white to the game. Official t-shirts are available at the SGA Bookstore all week for just $5.